Mercedes is considering improving the G class's stability and interior space by widening the body and lowering the roof slightly. FRANKFURT -- Mercedes-Benz's G class is expensive, about as sleek as a snow plow and it hasn't had a redesign since its introduction in 1979 -- and sales are higher than ever. Deliveries of the box-shaped car tripled in the past five years to 12,000 vehicles in 2013. 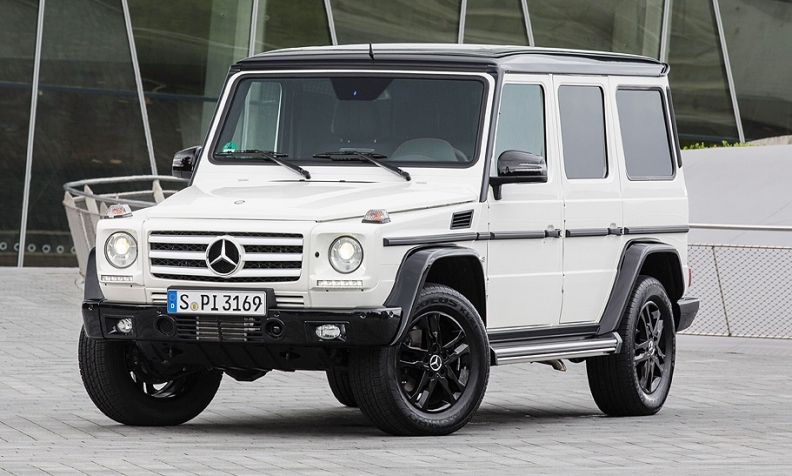 The top-of-the-range G 65 with a V-12 engine is the most expensive model in the entire Mercedes lineup. As the Daimler unit restyles the rest of its luxury SUVs, executives say the G class's angular form will stay the same. "It has to continue as it looks today," Daimler CEO Dieter Zetsche said last month. "It's not a vehicle that pretends. The G class is the original." Derived from a military vehicle, the $115,400 off-roader is a lesson in how ignoring trends can pay dividends. After the planned demise next year of the Land Rover Defender, the G class will be among the last old-school SUVs in production, drawing buyers because it literally stands out in a sea of streamlined cars. By combining a rugged exterior with interior luxury that includes a dashboard screen the size of a tablet and heated leather seats, Mercedes has made Beverly Hills or the French Riviera the natural habitat of the G class rather than the forest-coated Alpine countryside where it's made. Among its drivers are the Kardashians, the reality-TV clan who boast a whole stable of G classes, including at least one in matte. The future of the G class is playing out against a backdrop of change at Mercedes. The company is fighting a stodgy reputation as it tries to regain its former position atop the luxury-car market -- lost in 2005 to BMW. Zetsche has said he'll do that in part by making Mercedes vehicles sleeker and sportier. The brand's SUVs are key to that. Sales in the segment rose 12 percent to 324,700 vehicles last year. Mercedes expanded the lineup with a new compact SUV this year, and a sixth model, a coupe version of the M class, is coming in 2015. The G class is the first off-road vehicle the company made and the most expensive of the lot. The U.S. is its biggest market, with about one-fifth of sales, and more than half the vehicles sold globally are equipped with high-performance engines that bring their base price to $137,150. 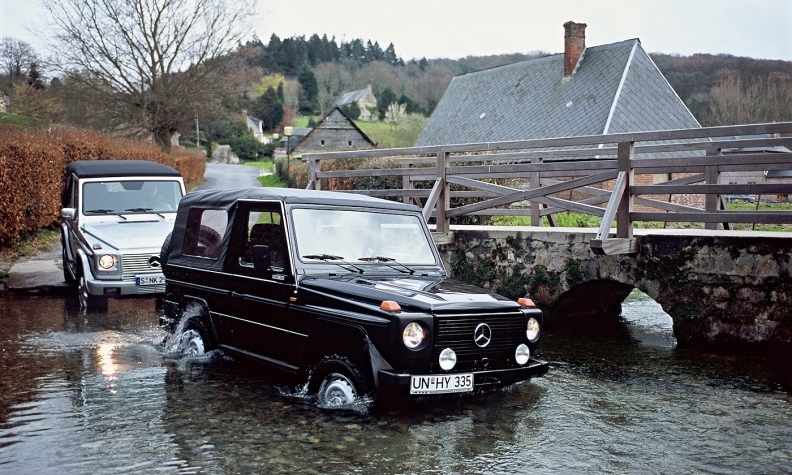 The 1979 Mercedes-Benz G Cabriolet, left, and the open-top G class of 2004. The G class will soon face more competition at the top of the market. Fiat Chrysler Automobiles' Maserati will start selling its Levante SUV next year, while Bentley, the British manufacturer of ultra-luxury cars favored by Queen Elizabeth II, has said it will roll out the world's priciest SUV at about $240,000 in 2016. Officials at BMW-owned Rolls-Royce said at this month's Paris auto show they are also weighing an SUV. Still, Mercedes expects G class sales will continue to grow, said Gunnar Guethenke, the model line's chief. The company says it doesn't consider Maserati and others to be competitors because of the car's proven backwoods abilities. "When it comes to the combination of off-road capabilities and luxury, there's no alternative," Guethenke said in an interview in his office in Graz, Austria. "The G class provides the genes for all Mercedes-Benz SUVs." Though the majority of G class customers never venture off-road, Mercedes expends a great deal of effort to make sure they could. The vehicle is subject to continuous testing on the 1,400-meter (4,600-foot) high Schoeckl mountain on the southern edge of the Alps. During a test drive there, the vehicle climbed up slippery rocks you couldn't master on foot, the right front wheel hanging in midair while the rear left wheel barely touched the ground. It ascended tracks with a more than 45-degree gradient and plowed through two-foot-deep puddles with ease. The old-fashioned truck-style construction -- which fixes the body to a separate frame instead of combining the two as a modern passenger car would -- gives the vehicle extra stability. "G stands for 'goes anywhere'," said Mario Summer, a test driver familiar with the tricks of the nearly two-mile Schoeckl course, which include shutting off the G class's parking aid sensors while driving through bushes. Production of the vehicle, which takes place about a 30-minute drive south of Schoeckl in Graz, has retained the idiosyncrasies of the car itself. People, not robots, fuse the 4,000 welding points and the 16 feet of weld seam that hold the body together. In another hall, more than a dozen seamstresses stitch together the leather seats. The 1979 G Class -- from the inside. Magna Steyr, a subsidiary of Canada-based Magna International Inc., has always assembled the vehicle for Mercedes and has a contract to produce the G class at least until 2022. Despite Zetsche's promise to keep the G class looking the same, it will need some tweaks to meet tighter EU regulations on pedestrian safety and emissions coming in 2016. Also being considered are improving the vehicle's stability and interior space by widening the body as much as 10cm and lowering the roof slightly, according to a person familiar with the plans, who asked not to be identified because decisions are not final. Regulatory changes helped contribute to Jaguar Land Rover's decision to pull the Defender after 67 years of production. Even as global SUV sales are expected to grow at a faster pace than the total car market, the market share of "hard-core" off-road vehicles will dwindle within the SUV segment from 5 percent this year to 4.1 percent by 2020, according to IHS Automotive. That encompasses the less plush vehicles such as Mitsubishi Motors Corp.'s Pajero, a record 11-time winner of the Paris-Dakar Rally. It used to include General Motors' Hummer brand, until the massive SUV fell out of favor with consumers and was wiped out amid GM's struggles to emerge from bankruptcy. None of these boxy, fuel-gulping cars make sense purely as transport in a world of tightening emissions regulations, said Anja Smetanin, a spokeswoman for VCD, an environmentally friendly transport club in Berlin. "We don't need them if we want to get from A to B," Smetanin said. Still, Mercedes is building ever more exotic variants of the G class, including a 6x6 three-axle model with a pickup load area behind a cabin that houses four electrically adjustable, heated and ventilated individual seats. Other changes would repel fans. "They shouldn't change anything on any account, otherwise the legend would get lost immediately," said Roland Kempf, who belongs to a Mercedes off-roader club in Stuttgart and owns two G-class vehicles. "Nobody needs such a vehicle, and it's a legend nonetheless."